Instant volume on top without backcombing. A well-known trick to create volume on top is backcombing. When backcombing the hair, the edges of the cuticles are teased in the opposite direction, causing a natural lift away from the hair shaft. Once these cuticles are lifted they never return to their original position completely, ending in hair damage and split ends. The Volume Supérieur provides instant volume on top without damaging the natural hair. The specially designed V-shape perfectly fits around the natural parting and is placed under a layer of natural hair for invisible integration. The easy clip-in application method makes it possible to safely boost volume on top in just a few minutes. 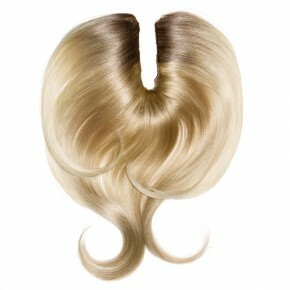 Made of 100% Memory®Hair, this hairpiece weights 30% less than human hair and is therefore very comfortable to wear. It mimics all aspects of human hair, feels soft and blends perfect with the natural hair. In contrast to other hairpieces made of synthetic fiber hair, the Volume Supérieur can be straightened or curled up to 160°C / 320ºF. It also remembers the last applied styling technique. Make a section of approximately 2 cm around the parting of the hair. Lift up the section and apply the Volume Supérieur around the section. Secure with the clips. Release the section and comb the natural hair over the hairpiece. Style as desired. Use the Conditioning Spray for Memory®Hair to keep the Volume Supérieur in perfect condition. The Volume Supérieur is perfect for those with fine, pit less hair or with a lack of volume on top. Use the Volume Supérieur in combination with the Hair Dress or Clip-In Weft Set to add extra volume to the lengths as well.